Who won season 13 of "American Idol"? 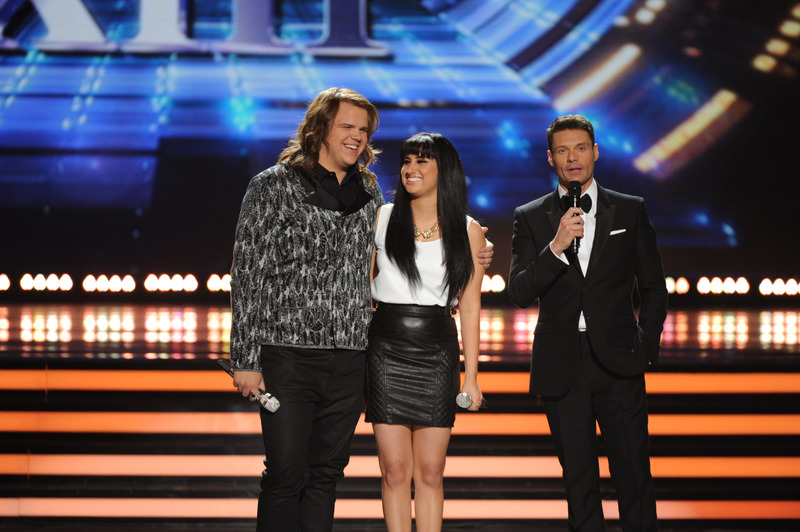 Big-voiced rocker Caleb Johnson is the season 13 "American Idol," winning the title over teenage pop singer Jena Irene. "This is crazy," Johnson said after host Ryan Seacrest announced the TV audience's decision on Wednesday's season finale of the Fox contest. Johnson, 23, of Asheville, N.C., and Irene, 17, of Farmington Hills, Michigan, told each other "you da bomb" before the result was revealed. Runner-up Irene is getting a consolation prize: The two competitors and friends are set to attend her high school prom, Seacrest said. Seacrest did not announce the number of votes cast, as was routine when the show drew huge audiences and impressive vote tallies. "American Idol," which long reigned as TV's top-rated show, now is a moderately successful, top 20 performer. Johnson's win came on the strength of his renditions Tuesday of "Dream On," "Maybe I'm Amazed" and "As Long as You Love Me," intended as his first single. Irene sang "Dog Days Are Over," "Can't Help Falling in Love" and "We Are One." He will receive a recording contract as this season's champion. "My voice is still not anywhere near where it was starting out this season," Johnson said on Wednesday, acknowledging his vocal chord issues before the Top 3 performance night. The two-hour finale included performances by John Legend, Kiss, Demi Lovato and Lady Antebellum. It also showcased a song by judges Jennifer Lopez, Keith Urban and Harry Connick Jr., with judge-turned-mentor Randy Jackson joining in. Even Seacrest took a turn crooning, proving as a singer he's a great host. He was joined on Richard Marx's "Right Here Waiting" by the singer-songwriter. NBC's singing contest "The Voice," which leapfrogged "American Idol" in the ratings, has leaned heavily on its performer-coaches to boost audience interest. Fox, acknowledging the glory days of "American Idol" are behind it, said it likely will cut the show from two nights a week to one next season, after the initial auditions. It wouldn't be the first reality competition series to do so. Both "Dancing with the Stars" and "So You Think You Can Dance" which were also trimmed down to one episode per week. The show, which hit a peak of 30.3 million viewers in the 2005-06 season, was drawing audiences in the single-digit millions this year. "American Idol" has launched the careers of stars including Carrie Underwood, Kelly Clarkson, Jennifer Hudson and many others. Tell us: Are you happy with this season's winner?